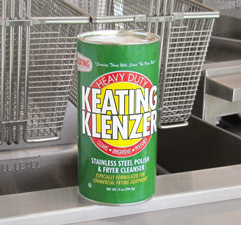 Keating Klenzer is the finest dry stainless steel polish available. No other cleaner lasts longer and cleans better. Stainless steel owes its sheen to innumerable fine light-reflecting scratches. When these become filled with grease, soap, dust or other foreign matter, stainless steel loses its natural luster. Keating Klenzer cleans deep down in the surface grooves to lift out dulling dirt and restore the original sparkling gleaming finish. And unlike liquid cleaners, no sticky residue is left behind. A small portion can clean large surface areas. Contains no soaps or detergents that will contaminate the fat.